When the last hostess relegated my dish to the kids’ table, I realized it was time to mix things up. For a cocktail party, I usually buy 5-6 ripe avocados. I use little, cherry tomatoes. 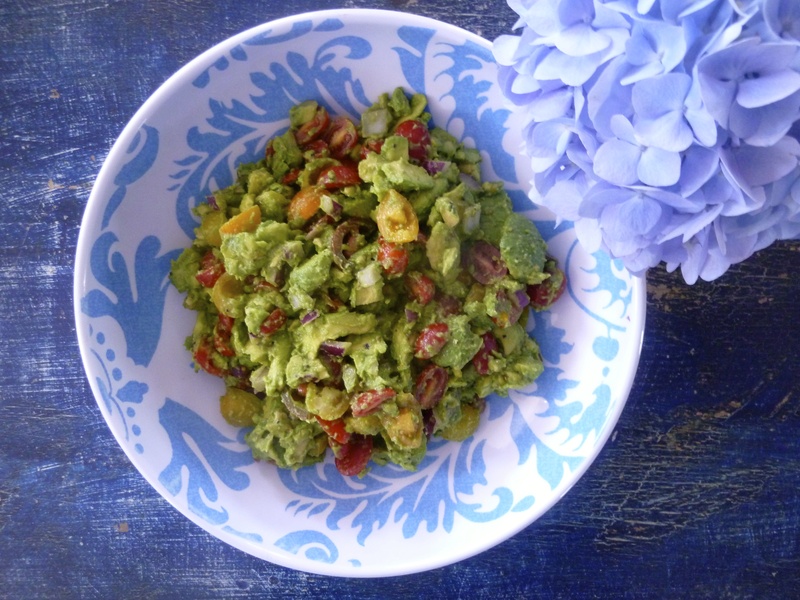 In the summer, there are lots of different varieties that make the guacamole colorful. One lime. Sometimes two depending on how much I am making, but lime can overwhelm the dish. My secret ingredient, Jane’s Krazy Mixed-Up Salt. Cilantro. This ingredient is optional. I love Cilantro, but a lot of people don’t. I sprinkle it on top of the guacamole, but you can leave it off too. Scoop out the ripe avocado flesh with a spoon and pile them all in a big bowl, leaving room to mix everything up. Get the lime on the avocado right away so the citrus juice keeps it from going brown. I don’t mash the avocado. Instead, I cut it into little pieces. Keeps it nice and chunky. Chop up the cherry tomatoes and add them on top of the avocado. Red onion to taste. I use about 1/4 to 1/2 cup, but it’s a personal preference. Salt and pepper is next WITH the Jane’s Krazy Mixed-Up Salt. I have my chopped Cilantro as a garnish or I will bring it along in a separate dish if the hostess wants to sprinkle on top. Mix everything up gently, almost fold the ingredients together. The avocado will break up if mixed too much. Voila! Keep the guacamole tightly wrapped and refrigerated until you are ready to serve. So far, my new strategy seems to be working. For real homemade hummus, my friend Susan makes an unbelievable one. I have had the recipe on my refrigerator for 6 years, but have never made it. Shocking. Here is the recipe (above) and it is delicious. Best guacamole ever! Most guacamole a now look like a smooth mashed mix of avacado or avacado mix. This guacamole is filled with chucks of real avacado, tomatoes and onions. Looks and tastes amazing.